Midwest Express strives to find the right fit for each driver. For some, that means more drive time to achieve higher income goals; for others, that means shorter drives to stay closer to home. We want to create the ideal situation for our drivers. Starting pay for company drivers ranges from $0.45–$0.52/mile. Pay increases are given based upon performance. New drivers are given credit for their experience and can be eligible for an experience bonus for an exemplary driving record and driving experience. See Compensation for more information. 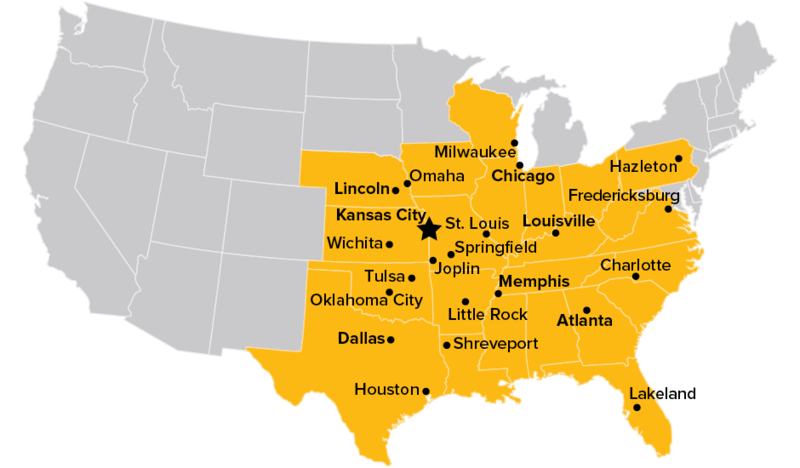 Our service map shows that we operate the fleet from the north (Wisconsin and Illinois) to the south (Gulf States and Texas). Labeled cities indicate drop trailer locations. Our trailer to truck ratio is 3 to 1. We want to keep you moving, eliminating unnecessary live load and unload. Ready to join the MWEX team? © 2019 Midwest Express Corporation. All rights reserved. Website by The Creative Department, Inc.